The Quinnipiac/Yale ice hockey rivalry has grown bigger and bigger over the past few seasons, culminated by last year’s national championship matchup on the men’s side. Come Friday night, a new chapter will be written for both the men’s and women’s teams. The No. 3 men’s team looks to bounce back from Saturday night’s 3-2 loss to St. Lawrence, as it travels to Ingalls Rink to face No. 13 Yale on Friday at 7 p.m. The Bobcats enter at 20-5-5 overall, and are second in the country in goals per game (3.70) and third in goals against (1.97). Quinnipiac and Yale played to a 3-3 tie in the first meeting between the teams in November, in front of a sold-out crowd at the TD Bank Sports Center. Yale is 11th in team offense and 13th in defense in the country, and is coming off a split weekend, beating Rensselaer on Friday before losing at Union Saturday. The Bulldogs are 6-2-2 at home this season, and 5-4-1 since the beginning of the new year. Seniors Kenny Agostino and Jesse Root each have recorded 22 points. Agostino has 11 goals and 11 assists, while Root has accounted for seven goals and 15 assists. Freshman goalie Alex Lyon enters play with a 9-7-4 record in 20 games, with a 2.28 goals against average. The women’s ice hockey team is set to host Yale at High Point Solutions Arena, puck drop scheduled for 7 p.m Friday. No. 8 Quinnipiac enters at 17-5-8, but has been held without a win in its last three games. The Bobcats were held scoreless at St. Lawrence on Saturday for only the fourth time all season. 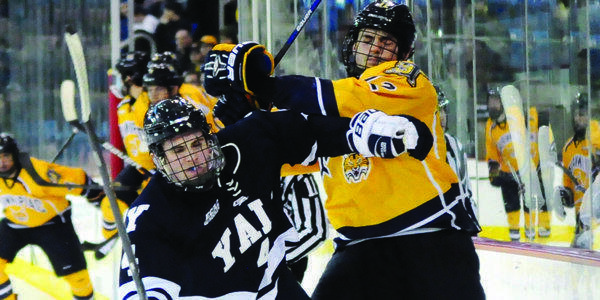 Friday’s matchup with Yale is critical for Quinnipiac, as it looks to get back on track with a win. This weekend marks the final two home games of the lady Bobcats’ season, though the Bobcats have a possibility of playing at home in the first round of the ECAC Tournament and even the Frozen Four. Yale enters at 7-13-5 on the year, playing its last four games without a victory. Phoebe Staenz lead the Bulldogs with 23 points, nine goals and 14 assists. Jamie Haddad has also notched nine goals. Jamie Leonoff controls the net for Yale, posting a 2.82 goals against average in 23 games.